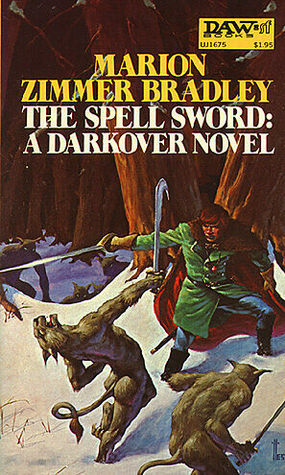 Up until this summer, The Spell Sword was one of the few Darkover novels that I’d never read. Some of the other books I have read but do not own, yet this novel haunted me like some elusive magical creature. Thanks to one of our amazing local bookstores, Cover to Cover books, I not only own The Spell Sword, I have read a missing piece of the Darkover saga for the first time. The Spell Sword is the story of Terran Andrew Carr and his adventures in the Hellers mountains of Darkover after his survey plane crashes, killing everyone else and leaving him stranded in the barren wilderness. He is urged not to give up by visions of a mysterious young woman who seems to speak to him telepathically, pleading for help. Is she real or some accident-induced hallucination? Will he discover his true destiny far from his own home or return to the safety and familiarity of the Terran Zone? The way in which the Darkover novels were written would cause modern writers and editors to shudder. Marion Zimmer Bradley explains it well at the end of this book in her “Author’s Note on Chronology”. “I do not think of them as a “series” but rather of Darkover as a familiar world about which I like writing novels, and to which the readers seem to like returning.” Perhaps this is why I find her books so incredibly satisfying to pick up and enjoy. Each novel is a self-contained story with a beginning, adventure and a resolution. Why do authors today need to leave their stories hanging? Do they feel that is the only way to create an audience and thus ensure continued income? Perhaps current authors need to learn a bit about true storytelling from the classic writers of the past century. Stories like The Spell Sword leave readers content instead of frustrated, involved instead of passively entertained and valued instead of taken advantage off. Paperback format, 156 pages, published in 1974 by DAW Books. 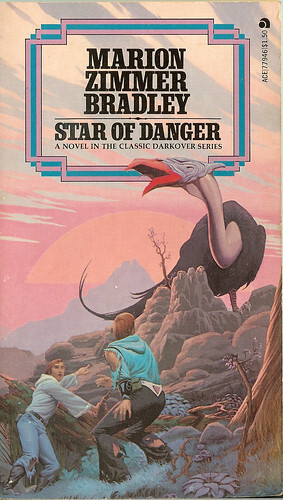 Star of Danger was one of the first Darkover novels I ever read. It was actually published the year that I was born, but I didn’t discover it until the summer before I turned 14. I remember reading this tale of two young men from different worlds who become brothers in all but blood when faced with incredible dangers and mistaken identity. Larry Montray feels drawn to Darkover from the minute he and his father land on the planet from Terra. He is determined to learn more that just the language and longs to see more than just the fringes of the town that brushes up against the Terran Empire Spaceport. Kennard Alton is the son of one of the ruling families of Darkover, but he is fascinated by outer space and technology. As their friendship grows, it becomes a bridge of sorts between the two worlds… but it also places both of them in incredible danger, especially when Larry is mistaken for Kennard and kidnapped by outlaws. Star of Danger is a classic coming of age tale packed full of adventure, intrigue and wonder. The tiny print and slim profile was typical of the day. Published with today’s larger fonts and wider margins, it would easily fill double the amount of pages. Regardless of the page count, the action is fast paced and sweeps the reader along to an incredibly satisfying conclusion. Paperback format, 160 pages, published in 1965 by Ace Books. “After reading all the posts, I am going to jump in here since I have already lived through piracy affecting my family income. For 16 years, while my children were small, I designed and wholesaled counted cross stitch patterns around the world. I produced them through a printer, since I was a graphic designer and did all of the pre-press and photography myself. I built the company up to where we were being sold in 26 countries around the world with 3 major industry distributors and was featured in several US magazines. Then China and Russia opened their websites to allow people from outside the country to post on their servers. Within a year, pirated charts were popping up after stitchers would scan them in at home to create illegal copies and then “share” them with other stitchers who couldn’t afford “expensive” patterns. Within 2 years, one major chain store stopped carrying all leaflets not produced by Leisure Arts ($18,000 loss from our family income per year) and stores began closing. Within 6 years, my income from stitching dropped 350%. Of the 98 designs I had spent 16 years creating, 57 of them were out there in illegal formats that I keep shutting down to this day. So I took my experience with me and moved on to illustrating children’s books. I have also become a small press publisher and had another press publish my first manuscript as an author this spring. Our second title has just been nominated for an award that will see 600 books go into the schools along with 19 other titles for the 2012-2013 Hackmatack award so that children in Grades 4-6 can read the books and vote on the winners. The saddest thing about this whole thread is that the arguments I hear from many of the people sharing e-books (or even those creating their own illegal e-books to share) is that the language and tone are identical to those who stole cross stitch charts and decimated the industry. It is not OK to profit from someone else’s creativity or deny them a reasonable payment for what they made. Most authors/illustrators receive 10% of the total book price at best as their royalty. Publishers no longer support new authors with promotion or travel costs until a book has “proven” itself. For every “Hunger Games” or “Fifty Shades of Grey” there are hundreds of published authors doing their own footwork, promotion, school visits, media tours, library visits etc. to try to find readers to enjoy what they have created. Most people who share illegally will never be convinced that what they are doing is wrong… but every now and then, someone’s story might make them stop and think. I read voraciously, but I use libraries, garage sales, book swaps and used book stores to feed my habit or save up for the authors that I love. I hope that maybe one person who reads this thinks twice about how their actions affect those who create something from nothing. These two Darkover novels are so intrinsically linked that, once I read them back to back again, I decided they needed to be reviewed together. Both of them form part of the Shattered Chain trilogy which deals with the Free Amazons of Darkover. The Shattered Chain was published in 1976 and deals with the Order of Renunciates, a group of women who believe in defining their own choices and destiny amid a very patriarchal society and culture. Thendara House and City of Sorcery continue the tales of the main characters, Terran Magdalen Lorne and Free Amazon Jaelle n’ha Melora who end up exchanging places and eventually blades as Freemates. These are both stories of women seeking to find their own places amid society’s expectations and following their true dreams. While these books were written in the 70s and 80s amid our own exploration of Feminism, many of the issues that Bradley explored then still ring true today. There are still women who feel that wrench between career and rearing children, between taking care of everyone else and finding time to take care of themselves. These two novels, against a Science-FIction/Fantasy setting with great plot twists and character development, explore those issues in a deep and meaningful way without ever taking away from the story or weighing the books down with too much philosophy. The more I reread Bradley’s work this summer, the more I marvel at her deft touch with words, plot and characters. I appreciate that each book tells its own story, even though some of them contain familiar characters. Each tale ends and yet they all weave together to form such a rich collection of stories to enjoy for the first time or rediscover once again. Thendara House – Paperback format, 414 pages, published in 1983 by DAW Books. City of Sorcery – Paperback format, 423 pages, published in 1984 by DAW Books. When this book was first published in 1993, I let out a squeal of glee. Two of my favourite authors had teamed up to fill in a gap in the Darkover timeline. Rediscovery is an insightful and compelling story of how Darkover came to be “rediscovered” by the Terran Empire some 2000 years after one of the Lost Colony ships crashed on the planet of the red sun. Mercedes Lackey, or Misty as Marion often called in in anthologies, returns to write this tale with the mentor who discovered her early work through the Swords and Sorceress anthologies that she edited through the 80s. Lackey went on to take those early short stories and write more about her world Valdemar, becoming a well-respected and prolific writer in her own right. Marion often mentioned how proud she was of Mercedes’ success. These two authors collaborate seamlessly to tell the vivid tale of how advanced human technology reacts when they encounter human stock in a pre-industrialized setting. Both women excel at social commentary to explore the type of difficult issues that Bradley never shied away from including abortion, exploitation, gender stereotyping, drug trafficking and cultural interference. Unlike many writing teams that share their separate styles back and forth in a double narrative, Rediscovery is a wonderful blend that flows so well, it is hard to tell who had a hand in writing which section. Many readers of the Darkover series have mused at how the planet might have been without ever coming into contact with the broader universe and the terran empire, but they should remember the first few stories about Darkover were precisely about that conflict between the two worlds and cultures. Without conflict… there is often no story. I m glad that both of these writers crafted this tale for me to enjoy this summer. Hardcover format, 307 pages, published in 1993 by DAW Books. I picked the hardcover copy of No Mercy in a sale bin at a local bookstore to add to my rapidly growing Kenyon collection. It felt a bit familiar as I read the first few chapters and I have a sneaking suspicion that I might have read a friend’s copy of this. Regardless, the story makes a lot more sense having now read the Chronicles of Nick series, Archeron and the other novels that I’ve acquired in the Dark-Hunter collection. Since I am not reading them in pure chronological order, there are a few gaps in background character knowledge that would probably make the reading experience slightly richer, but that is the beauty of having a vast set of books in your personal library – when you complete the collection at some point, you can go back and read them in sequence to fall in love with a sweeping series such as this all over again. No Mercy deals with one of the most intriguing characters in the series, the Sanctuary club’s bouncer Dev who just happens to be one of 4 quads (4 hunky brothers) and a Were-Bear to boot. Kenyon has no shortage of imagination when it comes to creating unique characters that break beyond the traditional romance novel mold! Add a 5000 year old Amazon Dark-Hunter to the mix who is haunted by the death of her husband and child in a gruesome betrayal and you have two people with far more baggage to overcome than your traditional Harlequin lovers. The fact that Samia is being hunted by demons who want to use her psychometric powers to find out how to destroy the Greek God Apollo also makes their relationship a little more challenging.